Assumptions are a powerful thing. If we assume something, for example that it will rain today, it affects how we plan for that day. You might grab an umbrella, reschedule a hike, or cancel a trip to the beach. Depending on your life experience and working definition, you may identify with many of these definitions above. The fact of the matter is when we make an assumption, we begin to own it or take possession of the idea or thought. We all make assumptions. It is part of our human condition. Here is the big question: What assumptions do we make about God? Our faith? Scripture? I think we would be naive to think we don’t make assumptions about God, either consciously or otherwise. 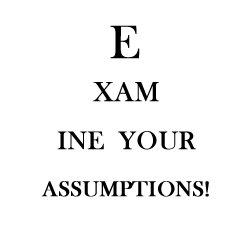 How can assumptions impact our faith? How do we move beyond these assumptions in our walk? Scripture has a few things to say about this danger. Do not stifle the Holy Spirit. Do not scoff at prophecies, but test everything that is said. Hold on to what is good. What happens when we go beyond just our assumptions? Then we will no longer be immature like children. We won‘t be tossed and blown about by every wind of new teaching. We will not be influenced when people try to trick us with lies so clever they sound like the truth. Instead, we will speak the truth in love, growing in every way more and more like Christ, who is the head of his body, the church. Assumptions require going deeper to find out what lies beneath a thought or notion. If we do the hard work of pressing beyond our assumptions we make ourselves open and available to the Holy Spirit. We might not always know the end result, but at least we haven’t settled in and stopped at simply assuming.